"If You're Happy and You Know It..."
Today's post is all about LilyGiggle Tybee Tank Top and Dress! This was my first time being asked to test for LilyGiggle and I was really excited to sew! A little back story, LilyGiggle Petunia Petal Pants were the first knit pattern that I "officially" sewed up (that wasn't a complete flop). And, the LilyGiggle Petunia Petal Pants were also the first PDF sewing pattern that I bought full-price, from a designer I had never tested for and/or experienced before... So glad that I gave LilyGiggle a chance! 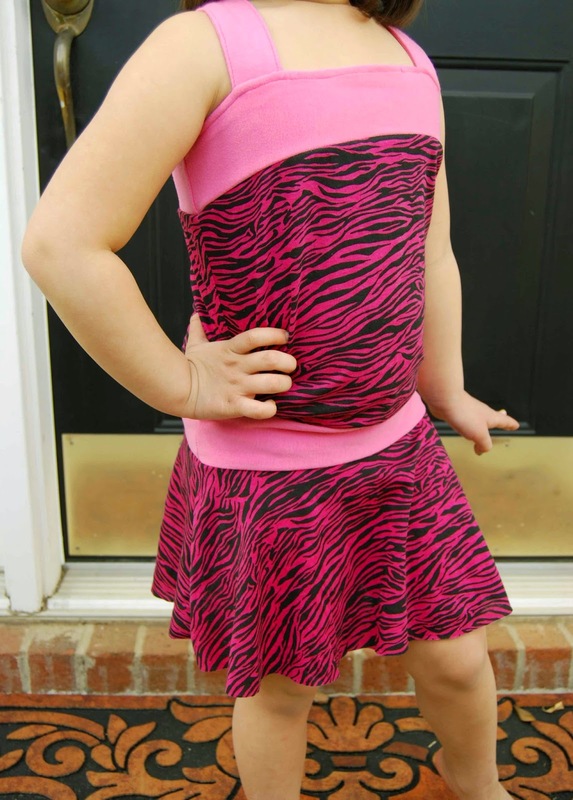 -Tybee Tank Top and Dress is for sizes 2-12. -The Tybee Tank Top and Dress can be made as either a tank top or a slimfit dress. -There are also included instruction on how to do an interchangeable bow in the tutorial. 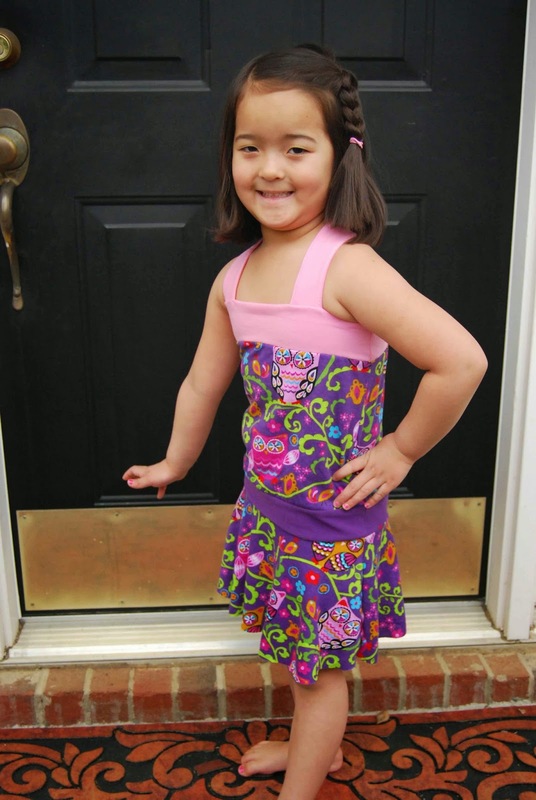 -Pattern pieces for the LilyGiggle Tybee Tank Top and Dress can be printed in just the size that you want by turning on/off layers. This is wonderful if you only want to print one size! No wasted paper or ink! -Tips for preparing the pattern pieces, fabric and how to get a perfect fit are included in the pattern. -A cutting layout diagram is also included in the pattern tutorial. This is especially helpful if you are using 1way stretch jersey knit. 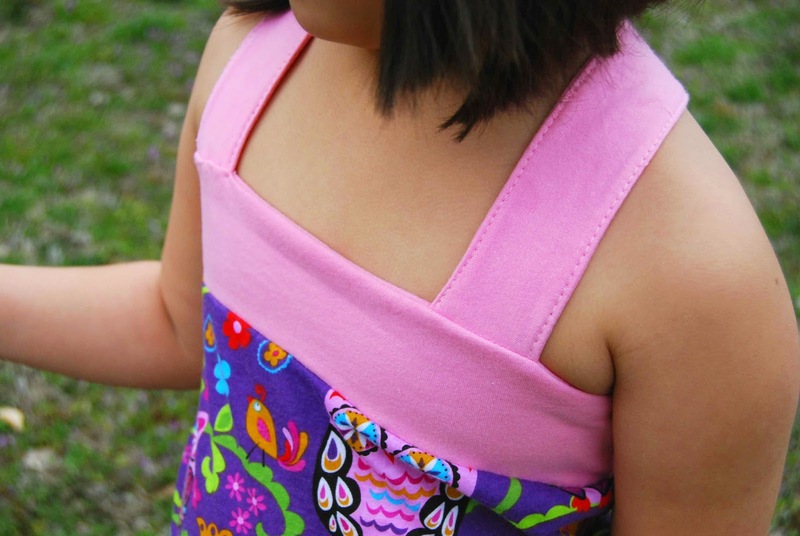 -The LilyGiggle Tybee Tank Top and Dress pattern does require some interfacing to stabilize and strengthen the straps and bodice top. I sewed up a size 5 dress. Lil' Miss LOVES her dresses!! I sewed up two different dresses for this test. The first one (the pink and black one) was definitely a tester as some of the options were done away with during the course of testing. C'est Le Vie! Sewing was a breeze because pretty much everything can be done on the serger. With the exception of some topstitching, everything else was done on the serger. It took me about and hour and a half to cut and sew up the first dress (pink and black one). See- super quick! Because knit fabric stretches around the body, the fabric requirements for the LilyGiggle Tybee Tank Top and Dress are minimal. If you did the top version, you'd need even less fabric! I used a bunch of scraps/what I had on hand for the purple owl dress. Love it when a pattern can just use up what you have and still look super cute! I love that most LilyGiggle tutorials include a "quick sew" list of instructions at the beginning of each pattern. Now, since I was testing this pattern, I went through the whole pattern. however, if you are a more experienced sewer, the quick sew instructions are for you! 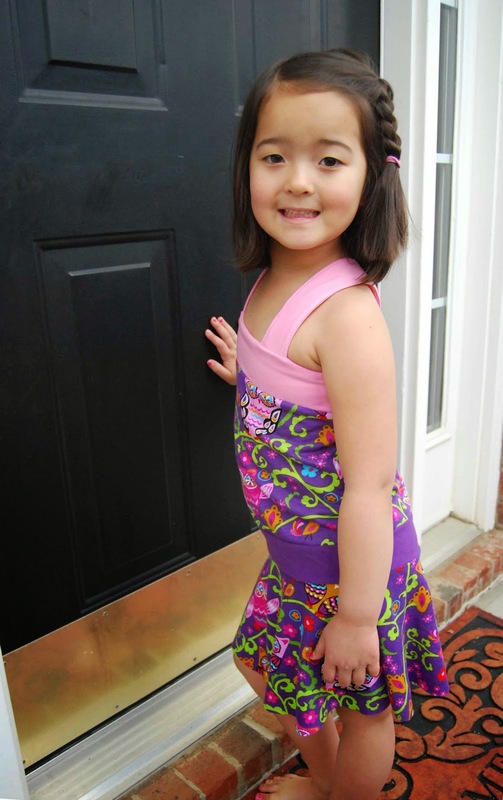 The LilyGiggle Tybee Tank Top and Dress tutorial is a simple read and easy to follow. The pictures helped aid in my understanding of the overall pattern and instructions. There's a lot of charts, words to get through at the beginning, but for somebody now quite so experienced in the world of sewing, it is invaluable information (not only about the pattern, itself, but about sewing, as well). Quick, easy, comfy and perfect for summer play.... I know that the LilyGiggle Tybee Tank Top and Dress will be a summer staple for Lil' Miss! 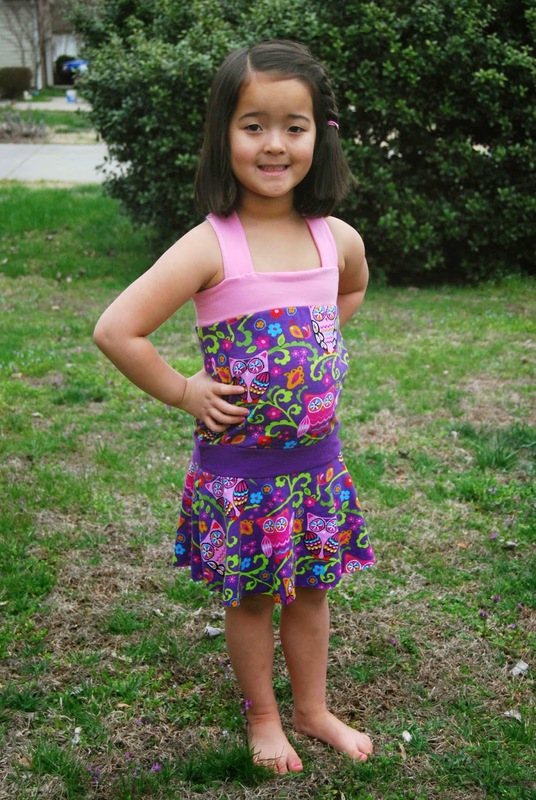 Now, go ahead and check out LilyGiggle and all of there wonderful patterns, including the Tybee Tank Top and Dress! You won't regret it!